Seracino's has been providing full catering services to film and television crews since 2004, catering for any size crew of from 5 to 500. Always to the highest standards but adapting to budget requirements as necessary. Khiron Security was formed in 2003 with the aim of delivering a higher standard of security in today's environment. With its network of local and foreign-based partners, the company offers security services in the field of event security, close protection, manned guarding, investigation, consultancy and training. The company has achieved a reputation for excellence which it strives to maintain with each and every client in Malta and overseas. The company has been contracted to provide its services for around fifteen film productions over the past years including ‘Troy’, ‘Munich’ and ‘The Da Vinci Code’. As leading specialists in real estate, Belair Real Estate offer a comprehensive selection of properties, both for rent or for sale all over Malta & Gozo. These include all types of apartments (both inland and seaview), villas and farmhouses with/out pool, penthouses, farmhouses and houses of character. Properties can vary from standard, but centrally located accommodation, to luxury and deluxe accommodation, suiting anyone’s budget and requirements. Our highly experienced commercial department can also assist with all types of office or location requirements. Whatever your requirements, our experienced and dynamic team can assist you with all your requirements, no matter how specific they may be. Positioned in the very heart of the Mediterranean, the archipelago of Malta – known to the ancient Greeks as Melita or Land of Honey – is a world-class resort. Blessed with near year-round sunshine and wide sweeping bays, this beautiful island set in crystal clear waters deserves - and delivers - the very best in luxury hospitality. Perfectly located at the entrance to St George’s Bay and offering magnificent panoramic views of the sparkling blue Mediterranean, as well as a private balcony with every room, the Corinthia St. George’s personifies the majesty and grace of a country that while small in size is large of heart and history. 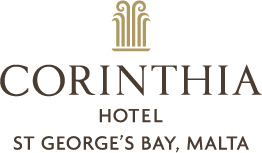 The Corinthia Hotel St George’s Bay. A destination that dreams are made of.